Paul W. Ryan graduated from New York Chiropractic College in 1989. He began practicing chiropractic in 1990, joining his brother Chris in the practice Dr. Kenneth W. Padgett in Waterloo, NY. In the spring of 2015, Dr. Paul took on a new role as the director of chiropractic services for the center. Paul completed 300 hours of post graduate studies in spinal biomechanics under Craig Leibenson. This extensive training included core strengthening, movement patterns, physio ball exercises, and spinal stabilization. He has also completed certification in Active Release Technique under Dr. Mike Leahy. Active Release Technique (ART) incorporates lengthening muscle and joint tissues in a clinical setting to promote healing, range of motion and restore normal function. Dr. Paul is certified for the spine, upper and lower extremities. 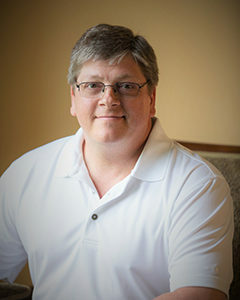 He is a current member of the New York State Chiropractic Association and has been on the adjunct faculty of New York Chiropractic College, teaching spinal and extremity technique, radiology and orthopedic testing. Dr. Paul is a lifelong resident of central New York and currently lives in the Town of Throop with his wife Michele and three children, Molly, Emily and Abbey. He enjoys the outdoors and spending time with his family.